1.0.0.1 The electromagnetic spectrum represents all of the possible frequencies of electromagnetic energy. It ranges from extremely long wavelengths (extremely low frequency exposures such as those from power lines) to extremely short wavelengths (x-rays and gamma rays) and includes both non-ionizing and ionizing radiation. 2 What are common sources of non-ionizing EMFs? 4 Why are non-ionizing EMFs studied in relation to cancer? 6.0.0.1 The National Institute of Environmental Health Sciences (NIEHS) website has informationabout EMFs and cancer. 6.0.0.2 The Occupational Safety and Health Administration website has information about workplace exposures to ELF-EMF. 6.0.0.3 The US Environmental Protection Agency website has information on power lines and other sources of EMF. 6.0.0.4 The European Commission also has general informationExit Disclaimer on EMF. 6.0.0.5 The World Health Organization website also has informationExit Disclaimer about EMFs and public health. 6.0.0.7 Copyright (c) 2019: Advanced Cancer Research Institute and agents. An electric field is produced by voltage, which is the pressure used to push the electrons through the wire, much like water being pushed through a pipe. As the voltage increases, the electric field increases in strength. Electric fields are measured in volts per meter (V/m). A magnetic field results from the flow of current through wires or electrical devices and increases in strength as the current increases. The strength of a magnetic field decreases rapidly with increasing distance from its source. Magnetic fields are measured in microteslas (μT, or millionths of a tesla). Electric fields are produced whether or not a device is turned on, whereas magnetic fields are produced only when current is flowing, which usually requires a device to be turned on. Power lines produce magnetic fields continuously because current is always flowing through them. Electric fields are easily shielded or weakened by walls and other objects, whereas magnetic fields can pass through buildings, living things, and most other materials. Higher-frequency EMFs, which include x-rays and gamma rays. These EMFs are in the ionizing radiation part of the electromagnetic spectrum and can damage DNA or cells directly. What are common sources of non-ionizing EMFs? There are both natural and human-made sources of non-ionizing EMFs. The earth’s magnetic field, which causes the needle on a compass to point North, is one example of a naturally occurring EMF. 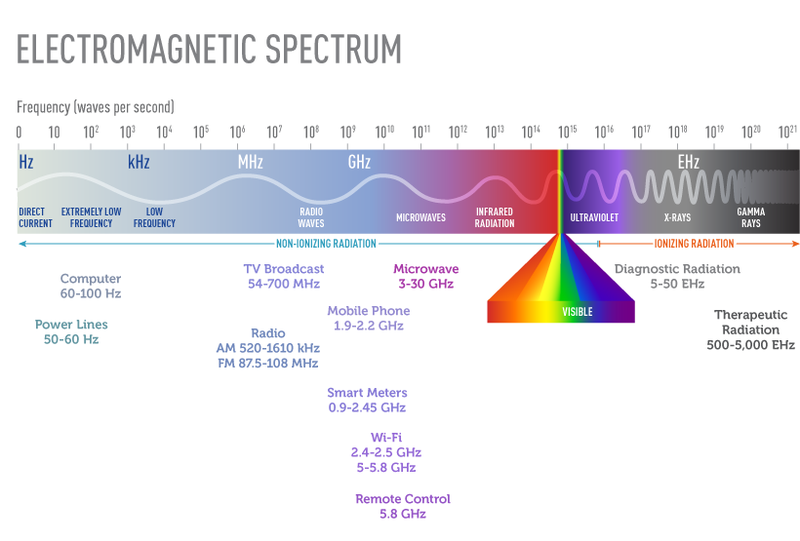 Human-made EMFs fall into both the ELF and radiofrequency categories of non-ionizing part of the electromagnetic spectrum. These EMFs can come from a number of sources. Extremely low frequency EMFs (ELF-EMFs). Sources of ELF-EMFs include power lines, electrical wiring, and electrical appliances such as shavers, hair dryers, and electric blankets. Radio and television signals. AM/FM radios and older VHF/UHF televisions operate at lower radiofrequencies than cell phones. Radio signals are AM (amplitude-modulated) or FM (frequency-modulated). AM radio is used for broadcasting over very long distances, whereas FM radio covers more localized areas. AM signals are transmitted from large arrays of antennas that are placed at high elevation on sites that are off limits to the general public because exposures close to the source can be high. Maintenance workers could receive substantial radiofrequency exposures from AM radio antennas, but the general public would not. FM radio antennas and TV broadcasting antennas, which are much smaller than AM antennas, are generally mounted at the top of high towers. Radiofrequency exposures near the base of these towers are below guideline limits (3), so exposure of the general population is very low. Sometimes small local radio and TV antennas are mounted on the top of a building; access to the roof of such buildings is usually controlled. Radar, satellite stations, magnetic resonance imaging (MRI) devices, and industrial equipment. These operate at somewhat higher radiofrequencies than cell phones (1). Microwave ovens used in homes, which also operate at somewhat higher radiofrequencies than cell phones (1). Microwave ovens are manufactured with effective shielding that has reduced the leakage of radiofrequency radiation from these appliances to barely detectable levels. Cordless telephones, which can operate on analogue or DECT (Digital Enhanced Cordless Telecommunications) technology and typically emit radiofrequencies similar to those of cell phones. However, because cordless phones have a limited range and require a nearby base, their signal strengths are generally much lower than those of cell phones (1). Cell phone base stations. Antenna towers or base stations, including those for mobile phone networks and for broadcasting for radio and for television, emit various types of radiofrequency energy. Because the majority of individuals in the general population are exposed only intermittently to base stations and broadcast antennas, it is difficult to estimate exposures for a population (4). The strength of these exposures varies based on the population density of the region, the average distance from the source, and the time of day or the day of the week (lower exposures on the weekends or at night) (1). In general, exposures decrease with increasing distance from the source (5). Exposures among maintenance workers have been found to vary depending on their tasks, the type of antenna, and the location of the worker in relation to the source (1). Cumulative exposures of such workers are very difficult to estimate. Televisions and computer screens produce electric and magnetic fields at various frequencies, as well as static electric fields. The liquid crystal displays found in some laptop and desktop computers do not produce substantial electric or magnetic fields. Modern computers have conductive screens that reduce static fields produced by the screen to normal background levels. Wireless local area networks, commonly known as Wi-Fi. These are specific types of wireless networking systems and an increasingly common source of radiofrequency radiation. Wireless networks use radio waves to connect Wi-Fi–enabled devices to an access point that is connected to the internet, either physically or through some form of data connection. Most Wi-Fi devices operate at radiofrequencies that are broadly similar to cell phones, typically 2.4 to 2.5 GHz, although in recent years Wi-Fi devices that operate at somewhat higher frequencies (5, 5.3, or 5.8 GHz) have appeared (6). Radiofrequency radiation exposure from Wi-Fi devices is considerably lower than that from cell phones (7). Both sources emit levels of radiofrequency radiation that are far below the guideline of 10 W/m2 as specified by the International Commission on Non-Ionizing Radiation Protection (3). Digital electric and gas meters, also known as “smart meters.” These devices, which operate at about the same radiofrequencies as cell phones, transmit information on consumption of electricity or gas to utility companies. Smart meters produce very low level fields that sometimes cannot be distinguished from the total background radiofrequency radiation levels inside a home (8). For household appliances and other devices used in the home that require electricity, magnetic field levels are highest near the source of the field and decrease rapidly the farther away the user is from the source. Magnetic fields drop precipitously at a distance of about 1 foot from most appliances. For computer screens, at a distance of 12–20 inches from the screen that most persons using computers sit, magnetic fields are similarly dramatically lower. Studies of animals have not provided any indications that exposure to ELF-EMFs is associated with cancer (9–12). The few high-quality studies in animals have provided no evidence that Wi-Fi is harmful to health (7). Although there is no known mechanism by which non-ionizing EMFs could damage DNA and cause cancer, even a small increase in risk would be of clinical importance given how widespread exposure to these fields is. What have studies shown about possible associations between non-ionizing EMFs and cancer in children? Numerous epidemiologic studies and comprehensive reviews of the scientific literature have evaluated possible associations between exposure to non-ionizing EMFs and risk of cancer in children (12–14). (Magnetic fields are the component of non-ionizing EMFs that are usually studied in relation to their possible health effects.) Most of the research has focused on leukemia and brain tumors, the two most common cancers in children. Studies have examined associations of these cancers with living near power lines, with magnetic fields in the home, and with exposure of parents to high levels of magnetic fields in the workplace. No consistent evidence for an association between any source of non-ionizing EMF and cancer has been found. Exposure from power lines. Although a study in 1979 pointed to a possible association between living near electric power lines and childhood leukemia (15), more recent studies have had mixed findings (16–24). Most of these studies did not find an association or found one only for those children who lived in homes with very high levels of magnetic fields, which are present in few residences. A pooled analysis of nine studies reported a twofold increase in risk of childhood leukemia among children with exposures of 0.4 μT or higher. Less than 1 percent of the children in the studies experienced this level of exposure (25). A meta-analysis of 15 studies observed a 1.7-fold increase in childhood leukemia among children with exposures of 0.3 μT or higher. A little more than 3 percent of children in the studies experienced this level of exposure (26). More recently, a pooled analysis of seven studies published after 2000 reported a 1.4-fold increase in childhood leukemia among children with exposures of 0.3 μT or higher. However, less than one half of 1 percent of the children in the studies experienced this level of exposure (27). For the two pooled studies and the meta-analysis, the number of highly exposed children was too small to provide stable estimates of the dose–response relationship. This means that the findings could be interpreted to reflect linear increases in risk, a threshold effect at 0.3 or 0.4 μT, or no significant increase. The interpretation of the finding of increased childhood leukemia risk among children with the highest exposures (at least 0.3 μT) is unclear. Exposure from electrical appliances. Another way that children can be exposed to magnetic fields is from household electrical appliances. Although magnetic fields near many electrical appliances are higher than those near power lines, appliances contribute less to a person’s total exposure to magnetic fields because most appliances are used for only short periods of time. And moving even a short distance from most electrical appliances reduces exposure dramatically. Again, studies have not found consistent evidence for an association between the use of household electrical appliances and risk of childhood leukemia (28). Exposure to Wi-Fi. In view of the widespread use of Wi-Fi in schools, the UK Health Protection Agency (now part of Public Health England) has conducted the largest and most comprehensive measurement studies to assess exposures of children to radiofrequency electromagnetic fields from wireless computer networks (29,30). This agency concluded that radiofrequency exposures were well below recommended maximum levels and that there was “no reason why Wi-Fi should not continue to be used in schools and in other places” (31). A review of the published literature concluded that the few high-quality studies to date provide no evidence of biological effects from Wi-Fi exposures (6). Exposure to cell phone base stations. Few studies have examined cancer risk in children living close to cell phone base stations or radio or television transmitters. None of the studies that estimated exposures on an individual level found an increased risk of pediatric tumors (32–34). Parental exposure and risk in offspring. Several studies have examined possible associations between maternal or paternal exposure to high levels of magnetic fields before conception and/or during pregnancy and the risk of cancer in their future children. The results to date have been inconsistent (35,36). This question requires further evaluation. Exposure and cancer survival. A few studies have investigated whether magnetic field exposure is associated with prognosis or survival of children with leukemia. Several small retrospective studies of this question have yielded inconsistent results (37–39). An analysis that combined prospective data for more than 3,000 children with acute lymphoid leukemia from eight countries showed that ELF magnetic field exposure was not associated with their survival or risk of relapse (40). What have studies shown about possible associations between non-ionizing EMFs and cancer in adults? Many studies have examined the association between non-ionizing EMF exposure and cancer in adults, of which few studies have reported evidence of increased risk (1). Residential exposures. The majority of epidemiologic studies have shown no relationship between breast cancer in women and exposure to extremely low frequency EMFs (ELF-EMFs) in the home (41–44), although a few individual studies have suggested an association; only one reported results that were statistically significant (45). Workplace exposures to ELF radiation. Several studies conducted in the 1980s and early 1990s reported that people who worked in some electrical occupations that exposed them to ELF radiation (such as power station operators and telephone line workers) had higher-than-expected rates of some types of cancer, particularly leukemia, brain tumors, and male breast cancer (12). Most of the results were based on participants’ job titles and not on actual measurements of their exposures. More recent studies, including some that considered exposure measurements as well as job titles, have generally not shown an increasing risk of leukemia, brain tumors, or female breast cancer with increasing exposure to magnetic fields at work (45–50). Workplace exposures to radiofrequency radiation. A limited number of studies have evaluated risks of cancer in workers exposed to radiofrequency radiation. A large study of U.S. Navy personnel found no excess of brain tumors among those with a high probability of exposure to radar (including electronics technicians, aviation technicians, and fire control technicians); however, nonlymphocytic leukemia, particularly acute myeloid leukemia, was increased in electronics technicians in aviation squadrons, but not in Navy personnel in the other job categories (51). A case-control study among U.S. Air Force personnel found the suggestion of an increased risk of brain cancer among personnel who maintained or repaired radiofrequency or microwave-emitting equipment (52). A case-control study found the suggestion of an increased risk of death from brain cancer among men occupationally exposed to microwave and/or radiofrequency radiation, with all of the excess risk among workers in electrical and electronics jobs involving design, manufacture, repair, or installation of electrical or electronics equipment (53). There was no evidence that electrical utility workers who were exposed to pulsed electromagnetic fields produced by power lines were more likely to develop brain tumors or leukemia than the general population (54). Employees of a large manufacturer of wireless communication products were not more likely to die from brain tumors or cancers of the hematopoietic or lymphatic system than the general population (55). A large prospective study among police officers in Great Britain found no evidence for an association between radiofrequency EMF exposure from personal radio use and the risk of all cancers combined (56). What do expert organizations conclude about the cancer risk from EMFs? In 2002, the International Agency for Research on Cancer (IARC), a component of the World Health Organization, appointed an expert Working Group to review all available evidence on static and extremely low frequency electric and magnetic fields (12). The Working Group classified ELF-EMFs as “possibly carcinogenic to humans,” based on limited evidence from human studies in relation to childhood leukemia. Static electric and magnetic fields and extremely low frequency electric fields were determined “not classifiable as to their carcinogenicity to humans” (12). In 2015, the European Commission Scientific Committee on Emerging and Newly Identified Health Risks reviewed electromagnetic fields Exit Disclaimer in general, as well as cell phones in particular. It found that, overall, epidemiologic studies of extremely low frequency fields show an increased risk of childhood leukemia with estimated daily average exposures above 0.3 to 0.4 μT, although no mechanisms have been identified and there is no support from experimental studies that explains these findings. International Agency for Research on Cancer. Non-ionizing Radiation, Part 2: Radiofrequency Electromagnetic FieldsExit Disclaimer. Lyon, France: IARC; 2013. IARC monographs on the evaluation of carcinogenic risks to humans, Volume 102.
International Commission on Non-Ionizing Radiation Protection. Guidelines for limiting exposure to time-varying electric and magnetic fields (1 Hz to 100 kHz)Exit Disclaimer.Health Physics 2010; 99(6):818-36. doi: 10.1097/HP.0b013e3181f06c86. World Health Organization, International Agency for Research on Cancer. Non-ionizing radiation, Part 1: Static and extremely low-frequency (ELF) electric and magnetic fieldsExit Disclaimer. IARC Monographs on the Evaluation of Carcinogenic Risks to Humans2002; 80:1-395. SCENIHR. 2015. Scientific Committee on Emerging and Newly Identified Health Risks: Potential health effects of exposure to electromagnetic fields (EMF): http://ec.europa.eu/health/scientific_committees/emerging/docs/scenihr_o_041.pdfExit Disclaimer, accessed August 15, 2015. The National Institute of Environmental Health Sciences (NIEHS) website has informationabout EMFs and cancer. The Occupational Safety and Health Administration website has information about workplace exposures to ELF-EMF. The US Environmental Protection Agency website has information on power lines and other sources of EMF. The European Commission also has general informationExit Disclaimer on EMF. The World Health Organization website also has informationExit Disclaimer about EMFs and public health.